In August UN Secretary-General António Guterres announced the appointment of Tripathi as assistant secretary-general and head of the New York Office of the UN Environment Programme, UNEP. A development economist and lawyer, Tripathi has worked for the UN since 1998 in Europe, Asia and Africa on sustainable development, human rights, democratic governance and legal affairs. Since 2017 he has served as senior adviser on the 2030 Agenda for Sustainable Development at UNEP. 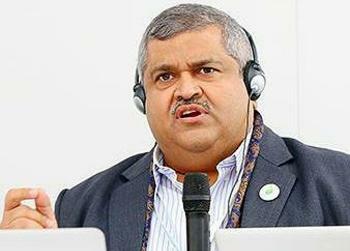 Tripathi’s role expanded, at least temporarily, as Secretary-General Guterres last week accepted the resignation of former UNEP head Erik Solheim of Norway whose spending on travel was deemed excessive. In a bid to define the banking industry’s role and responsibilities in shaping a sustainable future, UN Environment Finance Initiative, UNEP FI, and 28 banks from around the world Thursday launched six Principles for Responsible Banking for global public consultation. The announcement came during the 4th Climate Finance Day and the UNEP FI’s Global Roundtable, which took place at the Palais Brongniart in Paris from November 26-28. Principle 1 is “Alignment” with the objectives of the UN Sustainable Development Goals, SDGs, and the Paris Climate Agreement. Principle 2 is “Impact.” Using the SDGs and the Paris Climate Agreement, the signatory banks must identify, assess and be “publicly accountable” for the positive and negative social, environmental and economic impacts resulting from the bank’s capital allocation decisions and its provision of products and services. The other Principles cover transparency and accountability, stakeholders, customers, governance and target setting. The banks agree to set public targets for addressing their negative impacts and scaling up their positive impacts to contribute to national and international sustainable development and climate targets. The Principles are intended to enable investors, policy makers and regulators, clients and civil society to compare banks and hold them accountable for their environmental, social and economic impacts. The Principles are supported by an Implementation Guidance, which provides details of the rationale for each Principle and practical guidance on how banks can approach integrating them into their systems. Access Bank, Nigeria; Arab African International Bank, Egypt; Banco Pichincha, Ecuador; Banorte, Mexico; Barclays, United Kingdom; BBVA, Spain; BNP Paribas, France; Bradesco, Brazil; Commercial International Bank, Egypt; CIMB Bank, Malaysia; First Rand, South Africa; Garanti Bank, Turkey; Golomt Bank, Mongolia; Hana Financial Group, South Korea; Industrial and Commercial Bank of China, China; ING, Netherlands; Kenya Commercial Bank Group, Kenya; Land Bank, South Africa; National Australia Bank, Australia; Nordea, Sweden; Piraeus Bank, Greece; Santander, Spain; Shinhan Financial Group, South Korea; Societe Generale, France; Standard Bank, South Africa; Triodos Bank, Netherlands; Westpac, Australia; YES Bank, India. Here is an overview of what will be required of the signatory banks. The British multinational investment bank Barclays is one of the 28 founding banks and has been part of UNFI for more than 20 years. But Barclays is the only British bank to sign on to the Principles. No American or Canadian banks have done so. The Principles now enter a six-month global public consultation period before they are implemented in September 2019.